Lorraine began farming with her late husband Art not long after they married in 1950. Their farm is in rural Winona, MN. Lorraine raised eleven children along with foster children and exchange students on the farm. She always did the kitchen gardening, cooking and preserving. She always helped with the milking of 60 cows and other farm chores. She felt she was a “farm wife”. Lorriane has always been a farm advocate including membership in Land Stewardship and the MN Farmers Union. Lorriane still has her large gardens. Her children help with the planting, weeding and harvesting. Lorraine’s son is buying the farm. 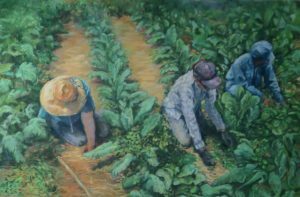 The pastel below shows Lorraine (in the straw hat) with daughters Ramona and Marilyn helping her weed..